A SWOT analysis of Apple (NASDAQ: AAPL) reflects its strong position as the market leader in several product areas. Continuously, Apple has excelled on the basis of quality and innovation. In terms of quality and technology, Apple remains unbeaten year after year. However, the competitive pressure from the mid level brands might be rising. Apart from that Google and Microsoft also pose important challenges. Apple maintains very high standards in terms of design and quality. However, the pressure of competition is very high. Some specific areas need more attention. Moreover, Apple’s pace of innovation can be greater. Apple is mighty, but after Steve Jobs is gone, the company and brand he built, must not lose its popularity. 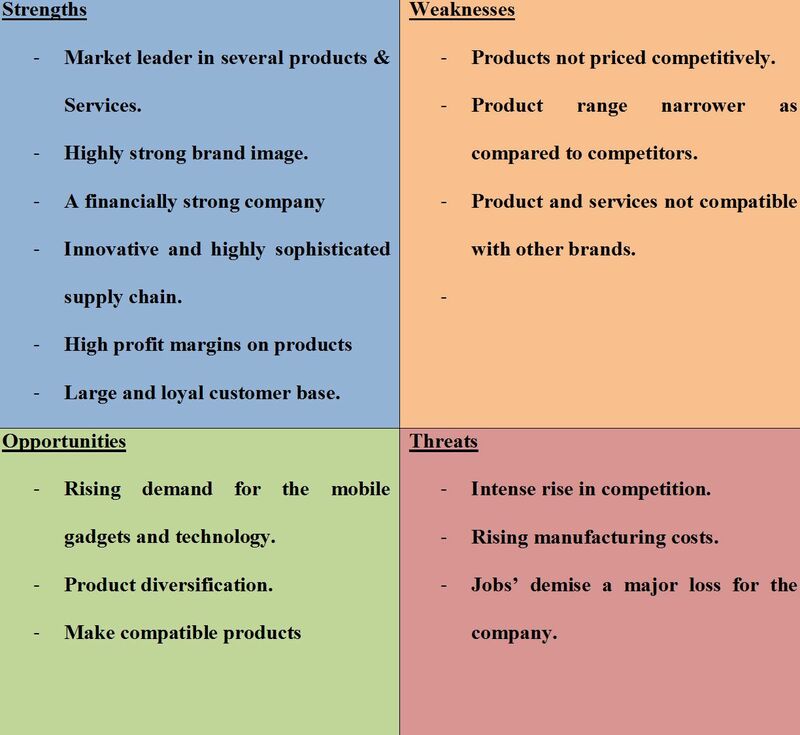 Here is a detailed SWOT of Apple ………..
“Apple’s first major strength is its position of a market leader across several product groups like cell phones and tablets. The company has a highly strong brand image. , It is in a financially strong position, with an annual revenue of more than 233 billion USD in the year 2015. In the year 2015, Apple became the first American company with market value of more than $700 billion. A highly sophisticated and innovative supply chain is also among the major strengths of the company. Apart from all these factors, it is the large and loyal customer base of Apple. The high profit margin on its products is also an important strength differentiating it from its competitors. In this way, the brand has some highly significant strengths apart from its array of highly popular products like IPhone, Ipod and I pad. These products set themselves apart from competition for their quality and unique design. Apple has always been known for its matchless quality of products and its innovation. Apple has a large number of fans and followers. Steve Jobs had played an instrumental role in bringing the company to this position. Apple no doubt, is a strong brand but still it has some weaknesses. Most prominent among them is the high prices of its products that are made for the high end market. Apples products are costlier than most of its competitors. Its products are also incompatible with the other brands. Apart from that Apple deals in a narrow product range. However, that can also be counted as strength. The opportunities for the Apple brand lie in the growth of mobile technology. The increased demand for smartphones and tablets presents a major opportunity for it. It is also the primary reason behind its rising sales. However, making products compatible with the other brands can also drive the sales of the Apple brand higher. Product diversification can also bring new opportunities. The brand is currently dealing in a very narrow product range. This product range can be further expanded and new products be included. Apple is an innovative brand. If it explores new avenues, it has the chances of bringing some more market leading products to the market. The Company is now facing increased competition from the brands like Sony, Samsung, Microsoft and even Google. Apple’s products are generally priced very high. These brands that deal in low price to high price products can pose a major threat as they draw larger numbers of customers due to their low prices. The manufacturing costs for its products are also rising. Even if that is not a very substantial threat, it cannot be ignored. Despite the financially strong position of the brand, the increased labor costs and higher manufacturing costs can be a threat. Job’s demise was also a major loss for the company. Whether the new leadership would be able to keep the company just as profitable or not, is a very significant question. Another major threat is the declining market of laptops and PCs. In the last few years, Apple has lost considerable market share to its competitors like Lenovo and HP. The rise of mobile technology has also reduced the sales of laptops and PCs. Apple is in a financially strong position. The brand can see continued and faster growth in the smart phone segment for the growing popularity and use of the mobile technology. The brand can also focus on cost control throughout its supply chain. Making compatible products as well as expanding the product range could also bring higher sales and profits to the brand. Apple has been doing some good business. This shows in its financial might and the popularity of its products. However, seeing the competition from other mega brands, it could do better by focusing on diversifying into new business areas. Moreover, its should not remain dealing in a narrow range. It already has great brand equity. It could use its existing brand equity to enter new fields and introduce new products. Apple’s position can be stronger given that its pace of innovation does not reduce. Other SWOTS you would like to check: Wal-Mart SWOT Analysis, Ford SWOT Analysis, Costco SWOT Analysis, Microsoft SWOT, Toyota SWOT .